Hello, dear authors~ From Feb 25 onward, the writing prompts contest shall undergo a change. The contest's time period shall be lengthened from one week to two weeks, and there will be more main prompt topics to choose from, as well as more abundant rewards. Here are the main topics of this writing prompts~! Writing is just like singing. It's something that everyone knows how to do. Whether it be a diary, blog, poem, song, essay, or short story... all of these are methods of recording that can be shared with others. Let us try a one chapter challenge, to make writing part of our daily lives. Rules of the challenge: no word limit, but all the words must be contained within one chapter (not including Volume 0 or prologues). The topic may be of your own choosing, but please don't have personal attacks against others. Diaries: It could be a record about the present or the past; it could be a record of tragedy or a record of beauty. Poem/essay: inspiration typically comes from our own lives. Song: perhaps see if a reader is willing to write a melody for your song. Short story: try taking some inspiration from Anton Pavlovich Chekhov, Henri René Albert Guy de Maupassant, or O. Henry. Others: any other category is fine as well. If you believe that writing is highly personal, then feel free to use the "draft" function in Inkstone. If you're willing to share with us, then please press "publish"! Click the create button at the top of webnovel.com's homepage. 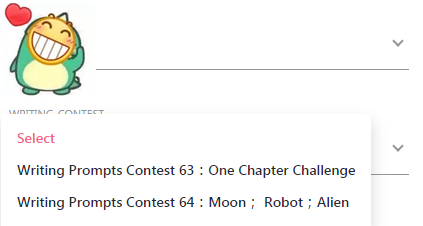 After you log in to the Inkstone platform, choose [Writing Prompts Contest 63：One Chapter Challenge] or [Writing Prompts Contest 64：Moon； Robot；Alien] in order to join the contest. 1.This contest will take place from 4/8/2019 to 4/21/2019, over a period of two weeks. The contest results will be announced three days after the end of the writing prompt on the jianghu forums. 2.The final ranking list will be determined by the number of power stones they receive within these two weeks. However, the editors will also determine the winners based on the quality of the story submitted. 3.Fan-fic novels are ineligible for final rankings. 4.Novels entered in the contest must be your original work with the copyright fully owned by you. No plagiarism shall be tolerated. 5.The main plot of your novel must adhere to one of the writing prompt's topics. Otherwise, it will be treated as a non-participating novel. 6.Your novel may not disparage other religions or cultural beliefs. 7.Webnovel reserves the right of final explanations. 1.We encourage new writers with no writing experience to try writing a short submission of 10k-20k words. 2.It's important to have daily updates in order to attract readers' attention. 3.Proactively communicate with your readers. You'll receive sincere advice and encouragement. 4.Every chapter's word count length is recommended at 1500-2000 words. At minimum, please don't go under 800 words per chapter. 5.The main character's name should have a name suitable for the cultural setting of the novel. Please don't imitate translated Chinese novels in using pinyin names. More localized stories are easier to show their strong points with. 6.If you wish to learn more webnovel writing techniques, please check out the Book of Authors. WEBNOVEL_OFFICIAL 3.Only novels that have more than 10,000 words will be eligible for final rankings. What about those in 1 chap challenge? WEBNOVEL_OFFICIAL Does this apply to the Writing Prompt #63? 3.Only novels that have more than 10,000 words will be eligible for final rankings. When will the results for the previous contest be published? And, please can you help me change the email connected to my account? I made a post about it last week, but no one has helped me yet. WEBNOVEL_OFFICIAL How many words should be there in #63... ?? WEBNOVEL_OFFICIAL Is it possible to put in multiple entries? Not all part of one story, diary entry, etc., but separate, like a blog in one and a poem in another. WEBNOVEL_OFFICIAL Heyao, what's next weeks prompt topics? Is there anything related to love? WEBNOVEL_OFFICIAL outstanding novels will directly receive the chance to sign a contract. Well, this one makes no sense for one chapter entries. WEBNOVEL_OFFICIAL 2.The final ranking list will be determined by the number of power stones they receive within these two weeks. This especially makes no sense when you stated for #63 that the "draft" function could be used for sensitive stories. So, you basically said that you can keep it draft, but not be in the running for a rank as you need to publish your story in order to receive powerstone votes. Sorry about being picky, but I see a contradictory statement here. Anyway, the prompts going to close in a few days. We'll see how this one turned out. Darkdelusion 10K words is only aiming at WPC64. I already made one with 1200+ words since you said no word limit but I fear it might be disqualified if you only accept not less than 10K words. So, please make us understand. JoanB The total word count of the story by the end of the contest period has to be at least 10000 words for it to qualify. For individual chapters, there isn't a specific length requirement, but Webnovel recommends at least 800 words each. As for #63, I don't see it as a single chapter = the whole story, but rather that like how one keeps a diary and writes in it everyday, the "one chapter challenge" is actually a write "one chapter per day" challenge. So, you have to post everyday like you're writing a diary, blog, poem, song, essay, or short story, etc. JoanB For WPC63, no word limit. Very looking forward to your work. Decided to make another contest thread like last time~! I'm not participating in it, but I'm still offering reviews just like before. Post your story link and prompt number on this thread. Chryiss You know, when you do something as efficient and wanted as this, it becomes your solemn duty XD. Chryiss Thanks for the info but I'm waiting for the Webnovel Official to answer it. I don't mind writing a chapter a day to fill the necessary 10K but I need to hear the WN people explaining it clearly. Chryiss i thought the one chapter challenge is just that : one chapter ? But what im confused about is this. You recommended to update the novel. Regularly so we should have a word count of at least 10k for the first chapter and then normally keep posting new chapters? Will those new chapters be also included in the contest or just the first chapter? Sorry about that, just a little confused here so sry if I misunderstood something. LongsonFullmetal WPC63 is an independent contest, within A chapter, but no word limit. Sorry for making you feel confused, we'll fix the rules ASAP. JoanB Funny thing was I was just about to say the same to the poster who asked the same question, that the wording is unclear, and then the app crashed on me in the middle of typing (like usual). LordArmyChicken On each Tuesday/Wednesdays. For your email problem, I've pass on to min tech. Sunnnyy Thank you, dear. I really appreciate the prompt reply.